Keyword ranking refers to the listing position of your keyword on the search engine results pages. These effective keyword tracking tips are relevant to search engines results on Google, Bing and Yahoo as well as minor search engines such as Ask. Some of the tools we discuss even offer you the Alexa rank and an analysis of backlink numbers, all of which offer very useful information to have about the performance of your website online. Here are three specific keyword ranking analysis tools that enable you to employ keyword tracking to assess how effective you have been with your SEO. Each of these enables you to establish your current ranking of selected keywords in stated domains. If you have two websites or blogs that use common keywords, it is necessary to state the keywords separately for each domain, so that you receive reports on how the same keyword is performing on each domain. Keep in mind here that ranking is generally applied to the individual pages of your website or blog, and not to the entire domain. If you are prepared to pay for your rank tracking (14-day free trial available), SerpBook is a rank tracker favored by those seeking more information than just the listed position of a web page or blog post. You can not only check your Google rankings but also where your keyword figures in Bing and Yahoo. This includes the search engine ranking of your YouTube videos. For from $4.95/month you can track from 25 to 5,000 keyword/domain combinations. The price increases with the number of keyword/domain combinations you choose, the 5,000 option costing $329.85/month. Your keywords can be sorted into categories relating to topics or individual clients. You also get daily updates of your Google Ranking and Alexa Ratings, and also a daily update of your backlinks. Since most of these parameters may not change on a daily or even monthly basis, this might appear to be overkill. However, unless you get daily updates how else can you be sure of detecting changes immediately they are applied? With SerpBook you can be notified immediately a ranking is changed – either up or down. This is very important information for anybody – from internet marketing newbies to professional bloggers. However, it doesn’t just stop there. You can provide your SEO clients with a link enabling them to view the live results of the keyword in any category relevant to them. Whenever they want to track their keywords, then can do so by visiting that link rather than call you and take up your time – or interrupt you at awkward moments! You can generate regular reports for your clients, providing them with an Excel or PDF report of the performance of their keywords on a 1 to 30-day frequency. These reports are completely automated, and can be delivered to you and/or your clients. Each keyword category can be the subject of a separate report and sent to separate email addresses if you so choose. Programmers have API access and can make unlimited API calls. This makes building your own dashboards or backends easier. You can also use a unique API for each individual keyword. Most people find it easier to compare data when provided in the form of charts. Not only does SerpBook offer charting of your historical keyword ranking positions, but you can track your ranking and how it varies with your SEO campaigns. There may be changes to your URL ranking influenced by changes to your text content, graphics or Meta data, article marketing campaigns, free vouchers, off-site marketing and any other form of marketing you carry out with a view to improving your rankings. Charts will enable you to relate your ranking to the dates you started making such changes or the launch of your SEO campaigns. Google Analytics can be iterated into your SerpBook account, enabling you to incorporate Analytics graphs into your reports. This is done in real time, so you can get an instant snapshot of how your keywords are performing. SerpBook.com is offering a free 14-day trial that does not require you to provide your bank or credit card details. It is well worth trying, particularly if you have a number of keywords that you want to track. Serpfox offers plans ranging in price from $10 – $200/month (50-5,000 keywords on unlimited domains. It also offers a free account where you are limited to 10 keywords. Like the other keyword tracking options above, you state your keyword and domain. 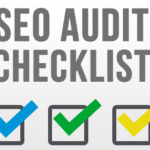 You will then be provided with your current SERP ranking, and will be notified of any changes over time. 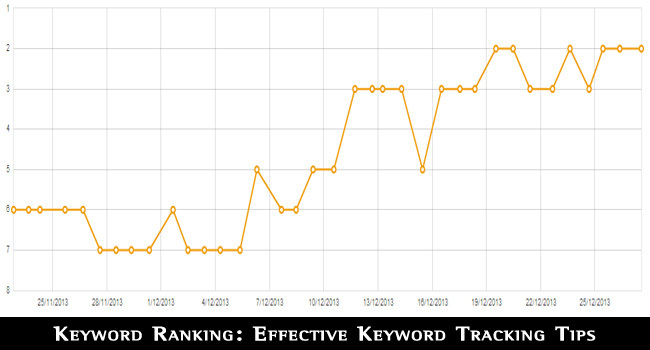 You are provided with a graph displaying the rankings of your keywords over time. You can group your named URLs to receive reports related to these or to grant access to clients or any others to certain data you want them to see. It is very similar to SerpBook in these respects. You can also arrange to be alerted if your ranking changes by a specified number of places, and your reports can be shared with your clients if you choose to do so. In many cases, it is good business sense to offer clients access to such reports – particularly if you are succeeding in improving their online exposure. Pro Rank Tracker has many packages including a free one which has a terms limit of 50 terms and only one update on demand. There are many other packages and their features are listed in the form of a neat table which you can check to decide. It is an excellent rank checker, and is very accurate yet simple to use. You can enter any number of keywords for each stated domain, and search their ranking on 10 search engines (including Google, Bing, Yahoo, Ask and AOL), plus a number of geographical versions of Google, Yahoo and Bing. You quickly receive the current and historical ranking on each requested search engine of each keyword used. 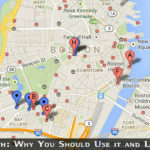 You are also provided with the local and global search volume for each keyword. You can ask for reports in graphical, PDF, CSV and Excel formats, and set any update frequency you want. You can also create categories, and there is a support forum and bug reports form if you have issues with the application. There is also a useful ‘Features Request’ form where you can ask for any feature you find missing. If all you want is a quick no-frills indication of your ranking on the common search engines for any number of keywords, then Pro Rank Tracker is exactly that! If you’re a looking for a solution that can show SERP of your web pages/blog posts when users search for keywords, SERPLab, which is available at www.serplab.co.uk, is one of the best choices to make! The best part of SERPLab is the free availability of the service, despite the fact that advertisements in pages may irritate you — but there is nothing we can do! Talking of SERPLab, as a way to track Search Engine Ranking position of your site for a particular keyword or keywords, the service has kept minimalism in terms of UI and a user will not be confused to start his journey with the tool. You can use SERPLab with or without registering an account in the website, but the former option will be best if you’d like to avail its professional features. After all, there’s nothing wrong in creating a free account, I hope. While that service provides a current ranking position of your site when you perform SERP check without registering an account, the registered account will let you create different projects and dedicate these projects for specific sites. For instance, it will be possible for you to create a project for www.yourdomain.com and list out keywords that you want to track. So, when you select that particular project, you can see a current position of those keywords in a list, the best position of theirs in the given period, search volume of that particular keyword, etc. Also, there are options to know details such as average change in SERP statistics of a website etc. SERPLab offers some other features such as exporting tracking data as CSV so that it can be used for analysis of your websites and their performance. However, if you think basic SERP bots of SERPLab are not able to solve your queries in a given amount of time, you have the option to hire another SERP bot. Altogether, SERPLab is something awesome as a free solution to track SERP! If you understand how to use Excel spreadsheets, then it is easy to build Google spreadsheets to help you track keywords and determine your keyword ranking. Here, we are using the “ImportXML” function built in Google spreadsheets which can scrape only the top 100 Google rankings for the input keywords. The script will create a new column every time it is called, insert the ranking, the time and week and whether the ranking has risen or fallen. 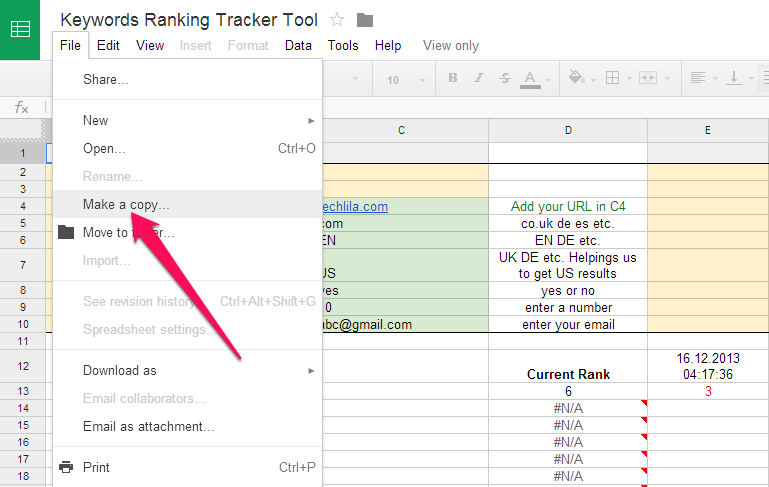 It can also give an email alert to you in case your rankings drop. 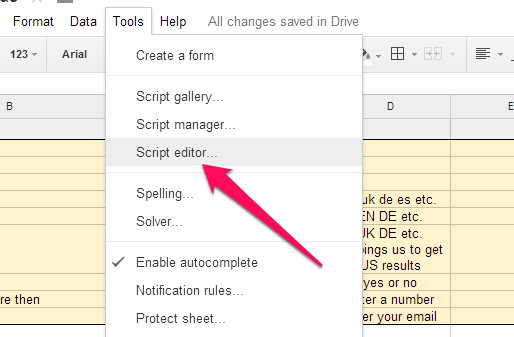 Creating a Google Docs script with some code will do the job. Most people have little knowledge of the coding required to achieve this, so all you need do is to copy the Google spreadsheet on this link (Make sure you’re logged in using your Google credentials). Step 3: Change the country in Cell C7 if you want, here’s a list of countries with an appropriate ISO Country Code. Step 4: Add the list of keywords you want to track from B13 down. There is a maximum of 50 permitted (because of Number of ImportXml functions restrictions by Google) on this spreadsheet, although you can use only one if you wish. Choose Resources -> Current Project’s triggers. Click on “No triggers set up” and add a new one. Under Run, choose the function which we want to execute and select “Time Driven” under Events. Choose the period, i.e. every day or every week that you would like to track your rankings and click on Save. That’s it. Your current keyword ranking will now be displayed in Column D, with columns E onwards being completed by Google over time. This is a very easy way to track your keyword ranking. 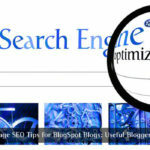 In fact, it is the easiest to use of all these keyword tracking tips. However, the information provided is limited to the Google ranking of the keyword concerned. This may be sufficient for most people since Google is by far the most important of the search engines still running. Many of the minor search engines do no more than provide Google results, so are not genuine search engines in their own right. Of those that do not, Bing and Yahoo are the most important, and our next suggestion includes results from these two search engines. Note: We’ve not created this script, developer of this script is unknown. While Google Docs offers a basic but effective means of tracking your keyword ranking, professional bloggers and internet marketers will probably be more interested in a more comprehensive keyword tracking service. 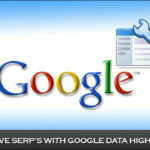 Both SerpBook and Serpfox provides such as service. Serpfox offers fewer features than SerpBook, though not everybody will need the same level of service offered by SerpBook. If all you want is to track is your Google and Bing Rankings, then Serpfox is OK for you. However, it only becomes cost-effective against SerpBook when you go above 200 keywords. Below that, prices are about the same, but can save most money with Serpfox for large numbers: up to almost $130/month for 5,000 keywords. The price for that is a lack of functionality such as incorporating Google Analytics, backlinks count. If you are new to tracking your keyword ranking, SerpBook offers a 14-day free trial, where you have no need to provide your credit card details. Try this service first and then compare it with the free Serpfox and Pro Rank Tracker accounts. Compare prices for the same level of keywords/domains, and test each using all the features and tools you would normally have to employ. Then make your choice: it is yours, but follow these keyword tracking tips first.